This post was written by Lusha Zhang, Software Development Engineer with Amazon Web Services. Parameter Store, part of Amazon EC2 Systems Manager, provides a centralized, encrypted store to manage your configuration data, whether plaintext data (database strings) or secrets (passwords, API keys for example). Because Parameter Store is available through the AWS CLI, APIs, and SDKs, you can easily reference parameters across AWS services such as AWS Lambda and Amazon ECS. Parameter Store recently launched hierarchy support, parameter tagging, and CloudWatch Events support, which makes it easy to organize and manage parameters at scale. In this post, I demonstrate how you can use these new features to scale and improve your security posture. Parameter Store support for hierarchies lets you organize parameters based on your deployment. It provides powerful tools for parameter organization, querying, and permission control. A common DevOps scenario is to automate software deployment across different environments such as Dev, Beta, and Prod. For example, when you create a deployment configuration, you can use Parameter Store to save your settings. Maybe you have to set the minimum healthy host number or percentage for each deployment environment, and want to store it in Parameter Store, with different values for each environment. For more information about how to use the SecureString type parameter, see About Systems Manager Parameters. 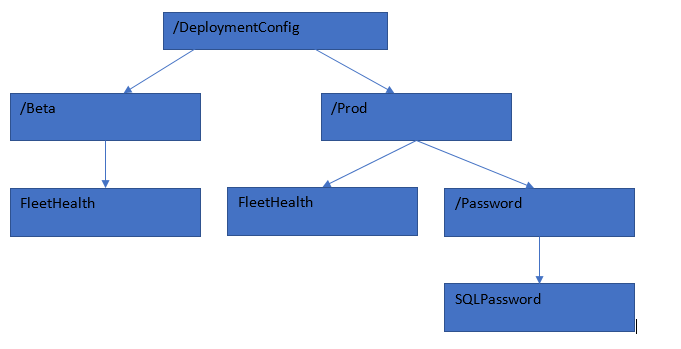 When you create a deployment configuration using an AWS CloudFormation template, you can set the FleetHealth for a Prod stage as in the following example. You can retrieve all the configuration parameters of your Prod or Beta environments using the recursive flag and parse the configuration hierarchy returned to get the parameter of your choice. You can also filter parameters by path from the AWS Management Console or AWS CLI. Now that you have created a parameter hierarchy for your deployment configuration in the Prod and Beta environments, you may want to restrict access to parameters. Maybe the Dev team should have access only to the Beta environment parameters, and not to the Prod environment parameters. Use IAM to control access to the Beta parameter hierarchy. For example, the following IAM policy restricts user access to Prod parameters. Now when a user runs the following command, they get AccessDeniedException. Tags let you manage your AWS resources easily. You can now also tag parameters, allowing you to group and query them. Using the same deployment configuration example, you can add a tag with a Tag Key value of “Password”, and Tag Value equal to “Beta” or “Prod”. You can also apply multiple filters to get a combined filter result. For example, if you apply Tag Key Password and a path /DeploymentConfig/Beta with the recursive flag, you get those parameters in your Beta environment that are password-related. You can manage the security access with IAM policies. For more information, see Controlling Access to Systems Manager Parameters. Parameter Store is now a CloudWatch Events source. 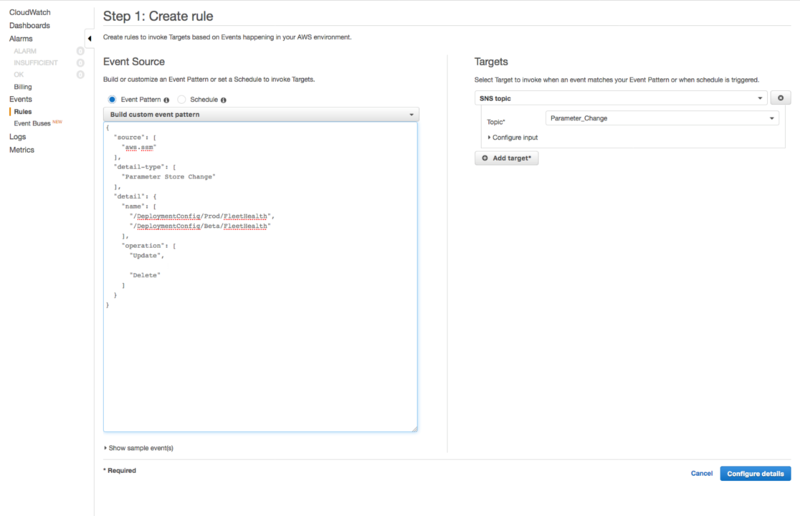 You can set up CloudWatch rules to trigger a CloudWatch Event target such as a Lambda function or SNS topic whenever a parameter gets created, updated, or deleted. When you change the value of the /DeploymentConfig/Beta/FleetHealth parameter, the CloudWatch event should show up in the metrics. In the meantime, the SNS topic that you created is triggered and you should receive an email as well. 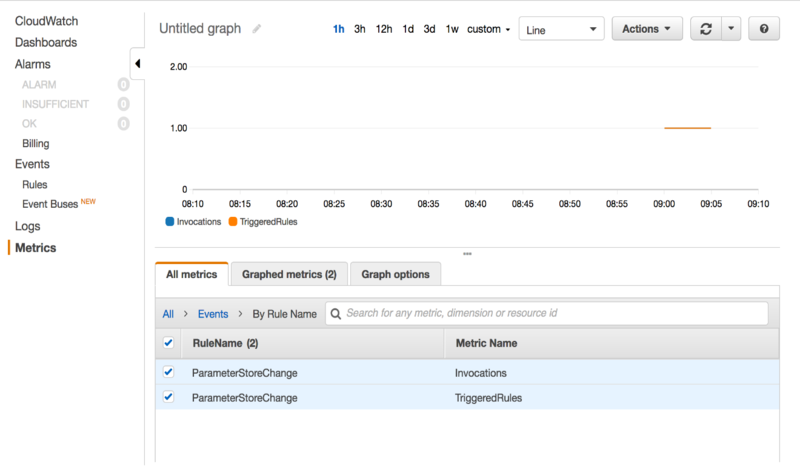 This post demonstrated several new Parameter Store features to manage parameters: hierarchy, tagging, and CloudWatch notifications. Hierarchical parameters make it easier to organize and control access to configuration data, whether plaintext or secrets. Tagging support provides you with another way to group and query parameters easily. With CloudWatch Events, you can get timely notifications about parameter updates. Lusha Zhang is a Software Development Engineer in the Amazon EC2 System Manager Team. She has worked on various products at Amazon from Amazon Textbook Rentals to AWS Parameter Store. Outside work, she enjoys playing the violin and the piano as well as surfing in the Pacific Northwest.